The Command Pattern’s definition is a stressful one to look at. – thereby letting you parameterize other objects with different requests, queue or log requests, and support undoable operations. 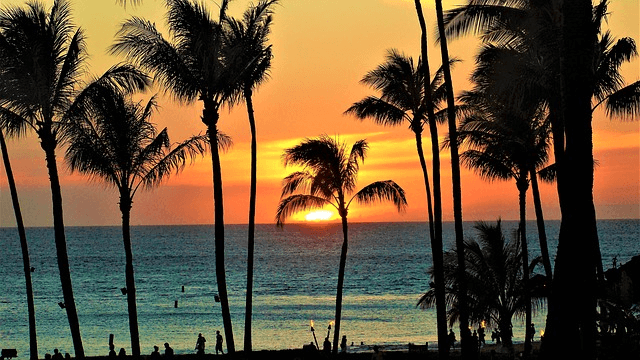 Let’s forget about it for a second and take a trip to Hawaii. And live in a luxury hotel. We spent the day on the beach, scuba dived, and did some sightseeing. It’s time to get back to the hotel to chill, eat, and plan for the next day. 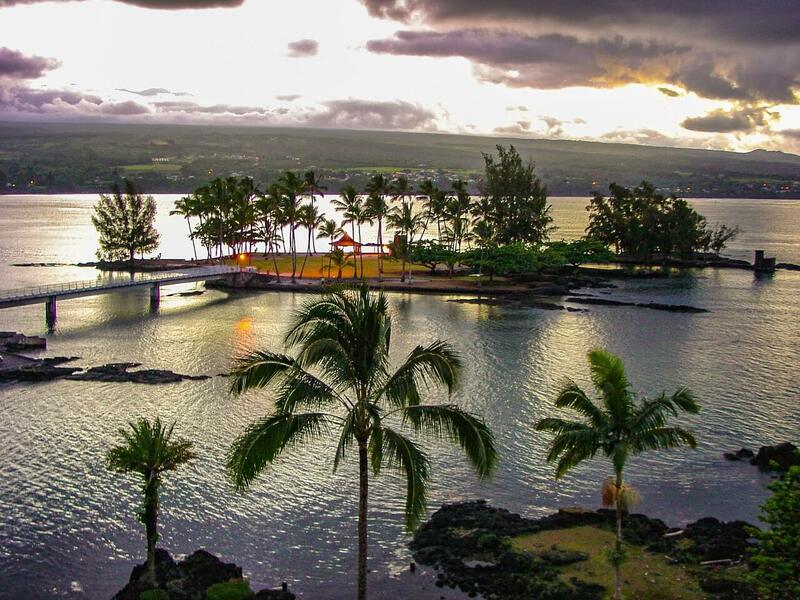 We check out the hotel’s service menu and find three service items matching our needs. We then call the front desk to place these three requests. A concierge picks up our call, write down our list of requests, and acts on each service request as instructed by the service menu. Let’s recap what just happened. 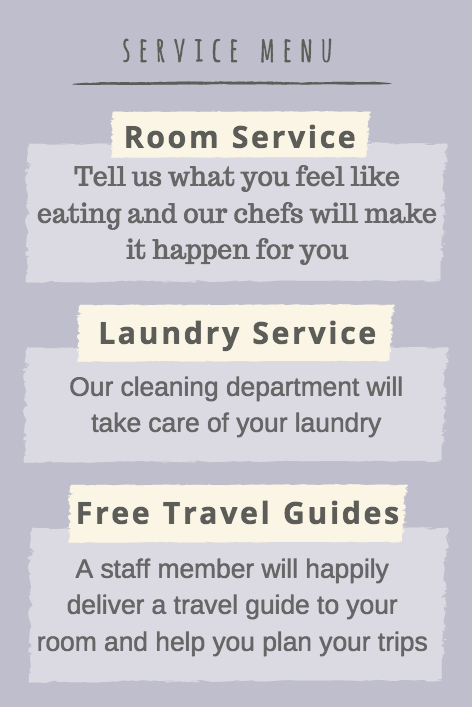 We selected the services we wanted from the menu and submitted them to a concierge. 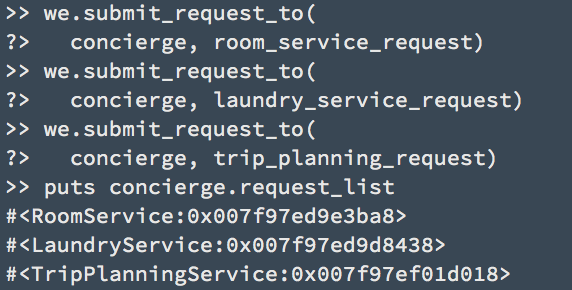 The concierge wrote these service requests down as a list. After we hung up, instructed by the service menu, the concierge sent our requests to corresponding departments. Each department executed on the given request. Let’s see the actions in Ruby. # a. We submitted our requests one by one to a concierge. 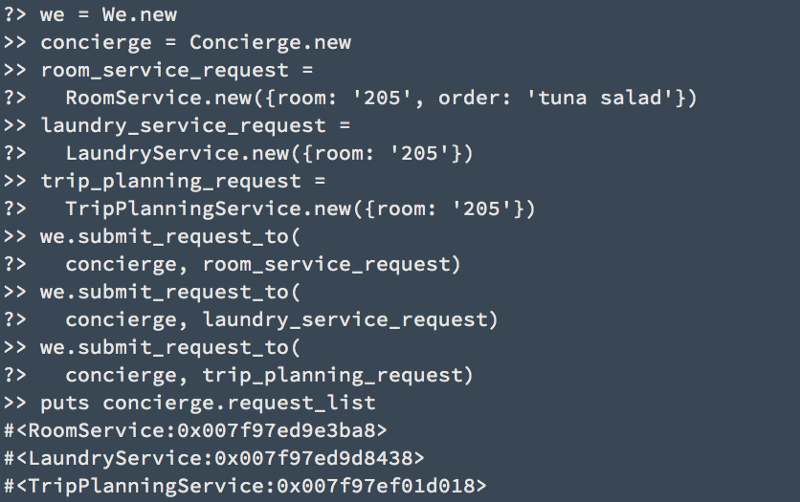 As we can see, after we submitted three requests, these requests were in a request_list taking care by concierge. 3. 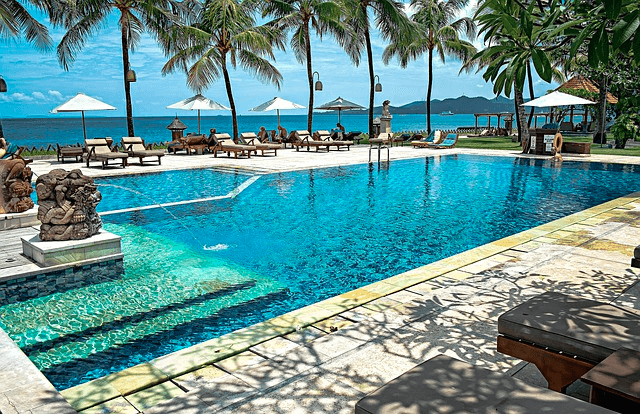 Instructed by the service menu, the concierge sent our requests to corresponding departments. The code above should work fine. Why does this part smell bad? 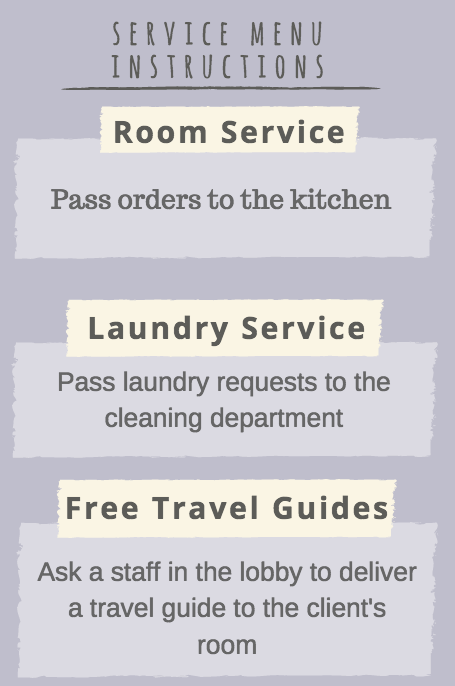 If the hotel offers twenty services, instead of three, the method will be really long. 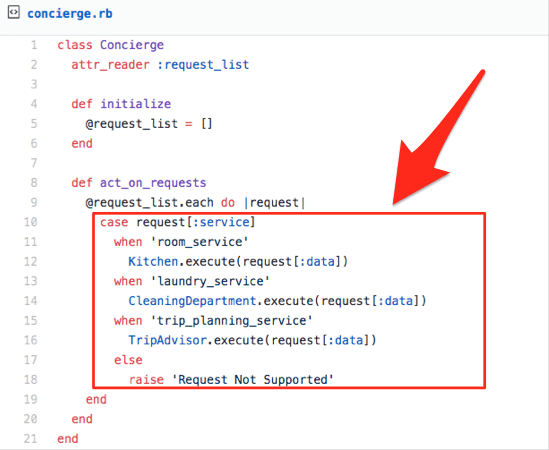 Each time we want to offer new services or remove an existing service, we have to open the Concierge class and redefine the act_on_requests method. The method knows too much and requires frequent changes. Having these two combinations together is almost always a bad thing. A method that requires frequent changes is a method you need to update often and each time you update a piece of code is an opportunity to introduce new bugs to the system. When the method also knows a tone, a.k.a. it’s long, the chances of messing it up when updating increases significantly. That’s the reasoning behind a design principle we talked about earlier––encapsulate what varies. Take a closer look and think about it. Let’s rephrase what the code is doing in English. We loop through the requests on the request list. 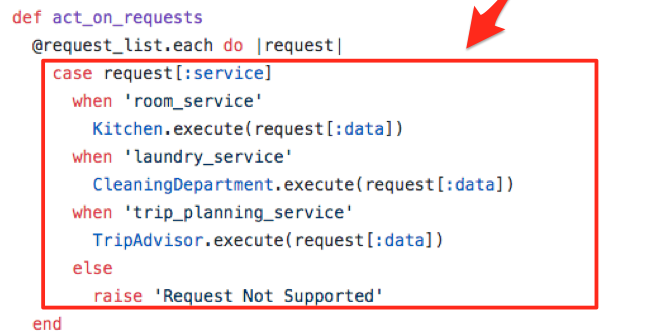 For each request, according to its service type, we give the corresponding department related data and execute the request. Essentially, we loop through the requests and execute on each of them accordingly. But what if each request actually knows how to execute itself? Instead of letting the act_on_requests method decides how each request should be handled, we distribute that responsibility and knowledge back to each request and let it decide how to itself should be handled. With the updated codes, here is how we, customers of the hotel, send requests to the concierge. 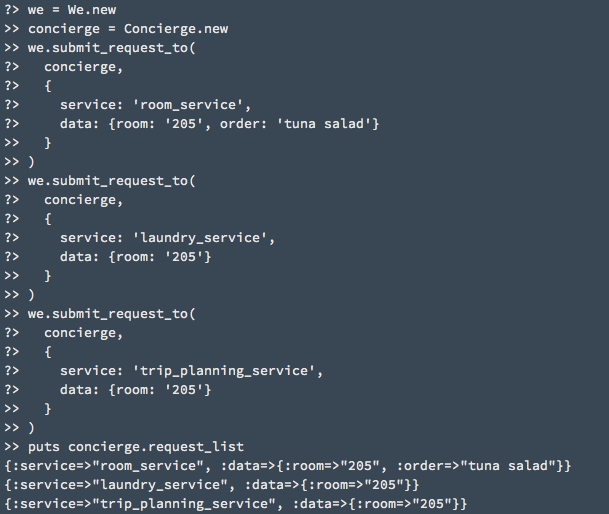 It is pretty easy to create another service. The service not only supports execute (making a spa reservation) but also undo (canceling the reservation). We can just press the button and the service with a default setting will be delivered to our room.
? ?We are using the Command Pattern!?? 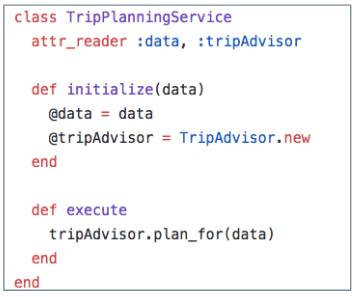 Each of the services class we created, RoomService, LaundryService, TripPlanningService, and SpaReservationService, is an example of encapsulating a request as an object. The ServicePanel is an example of parameterizing an object with different requests. Our requests were queued while the concierge was taking them over the phone. 4. and support undoable operations. – and support undoable operations. Yup, the advantages of the command pattern is encapsulated into its definition. ?